Please can you help with any natural remedies for retinitis pigmentosa, which causes night blindness and visual impairment. Hi Isaac, and thanks for your question regarding natural and home remedies for retinitis pigmentosa. Firstly, for those who don't know, retinitis pigmentosa is an eye disease that usually starts with night blindness, followed by progressive loss of peripheral vision. Over a period of several years this further results in “tunnel vision,” and can lead to total blindness. 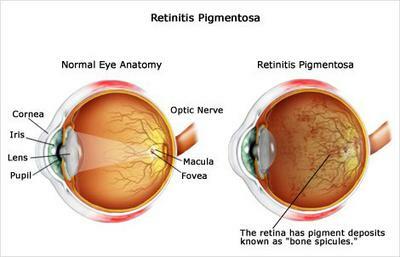 Most people with retinitis pigmentosa are legally blind by age 40. An estimated 1.5 million people worldwide are actually affected by this eye disease. #1. Vitamin A (Retinol): Vitamin A supplementation is the standard "must do" remedy for retinitis pigmentosa. It definitely helps to delay the progression of the disease and improve eye sight. carotene. So it still works just as well for eye health as supplemental vitamin A anyway! The standard minimum dose of beta carotene is 25,000 IU per day. #2. Cod Liver Oil: Cod liver oil is rich in natural vitamin A and vitamin D. Both of these are essential for eye health. Cod liver oil also containd high amounts of essential fatty acids (EFA's) which are crucial for the health of the eyes as well (remember this, Eskimo's eat high amounts of EFA's and rarely ever get eye diseases). When you buy your cod liver oil, make sure you don't go with the cheaper brands though. Recent analyses have found many cod liver oil supplements to be rancid and actually low in vitamin D and vitamin A. This brand is one of the best (and safest) on the market... Carlsons Cod Liver Oil. #3. Zeaxanthin & Lutein Sub-lingual Spray: Lutein, zeaxanthin, L-Lysine, bilberry and gingko biloba have been found in studies to help tremendously with virtually all eye problems and eye degeneration diseases, including retinitis pigmentosa. This terrific spray delivers a powerful dose (you spray it under the tongue), which actually helps to relieve symptoms in just a few minutes! This spray was originally designed by doctors to just treat macular degeneration, but they found it also helped with other eye diseases such as retinitis pigmentosa. You can check it out here if you're interested... Ethos Mega Focus. And don't forget to eat lots of "eye health" foods such as carrots, dark leafy greens, eggs (particularly the yolks), citrus and berries, almonds, and cold water fatty fish. So I hope these tips and remedies help you out Isaac. Good luck and all the best to you! Thank you very much Troy. I cannot wait to take action on the advice and will update you on the progress. You're very welcome Isaac. And yes, please keep us updated. Does billberry have any effect on RP? I have heard that it helps with night vision.